There are two perfect adjectives to describe Porsche sunglasses: simplicity and sophistication. In general lines, the German brand has always been characterized because of the creation of exclusive and luxurious products. Porsche Design uses classical lines in which functionality is an important element. Some of the Porsche sunglasses have become in authentic icons. An example of this is the model Porsche Design 847, which has been one of the brand's best seller, thanks to that Yoko Ono, took them in numerous occasions being the cover of many style's magazines. Another representative model, is the Porsche Design Carrera. This model represents the classic aviator sunglass with a more vintage touch. This model is very trendy due to the fact that some members of the Kardashian's family wear it frequently. This shape is the most common inside the brand's models. Porsche Design use these models with some variations such as different sizes, colours or styles. Inside this group is important to stand out the shield designs, which are some of its most outstanding models. With a sober style, the square and rectangular glasses, have always been associated to a more serious style. Porsche knows that this design is a secure bet, because it gives the distinction that its clients look for inside the brand. Porsche Design try to reinvent itself with this new style, but following the same line. Simple models with classic colours such as green or brown in its lenses and gold temples and bridge. In the case of the eyeglasses, the brand is focus into create functional models. Using light materials that gives comfort and functionality. 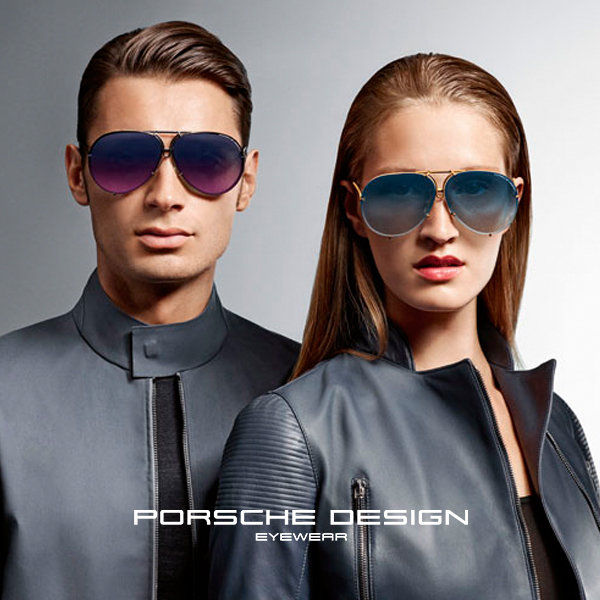 Porsche glasses have as protagonists' materials such as titanium and aluminium, which give lightness and flexibility. Its frame's colours don't use to be striking, by the contrary, they are serious and sober colours. In general lines, Porsche Design bets for unisex designs, they want them to be useful for men and women. For this, it follows a series of neutral lines with the objective of don't make any difference between their glasses, and in this way they want to make bigger the option's possibility in order to offer to their clients more possibilities. Porsche started to produce around 1931, but it was later when Porsche Design was created. They wanted to distribute not only cars, but also more products such as watches or glasses. In our Web page you will find all the Porsche Design models at the best prices. Out professional team will help you during the purchase process.